A few months ago, Three Thrifty Guys began approaching several companies that we have grown to “like and trust” in hopes they might wish to partner with us by providing sponsorship dollars to the website. In return, TTG would produce some content on their behalf . 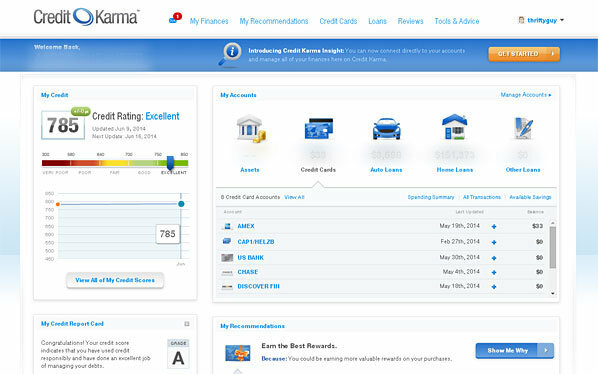 We are pleased to announce one of these companies that accepted our advances is Credit Karma. You may have seen one of their TV commercials recently touting the “free credit score” they offer (my personal favorite): I have dealt with the Credit Karma staff several times before their sponsorship and they have been very supportive of TTG in the past by linking to some of our articles at their blog. They’ve also been patient with some of my annoying questions about credit scores (Thanks Jennifer!). So I always thought it would be a pleasure to partner with them down the road if we ever got the chance. Today I want to offer my thoughts of the Credit Karma website and some of the things you can take advantage of after you’ve grabbed your free credit score and are logged into the site. Many online credit score/report services have gotten a little bit of a bad rap after some got caught using “deceptive marketing tactics” (ie, asking for your credit card upfront and then charging you a monthly “fee” afterwards) (reference Experian’s FreeCreditReport.com). From my experience with the site and their services, Credit Karma is very transparent about what they are offering and how they are able to do so. Being a designer – I can really appreciate the user interface design and how everything is very easy to access and negotiate. The only critique I have is that some of the text is quite small and I worry about users who have poor eyesight and don’t know how to enlarge their text on-screen. 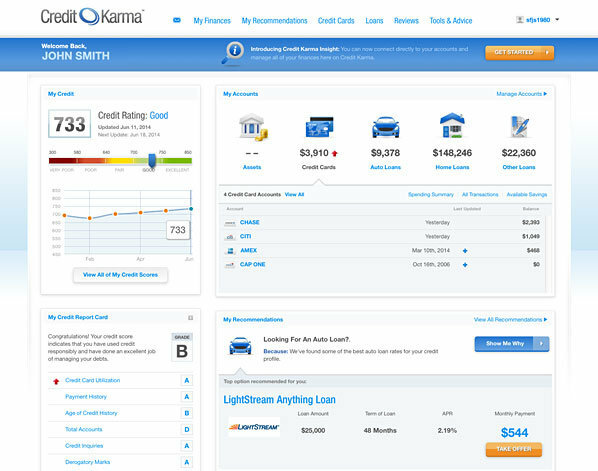 Credit Karma will pull your credit cards and other credit sources you have open (including any home loans, auto loans, etc). You can also pull in other accounts you have available (like your bank accounts, investments, etc). One of the neat features of their services include their “Tools and Advice” section. 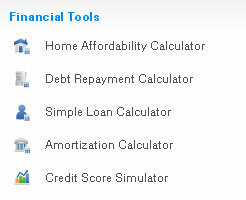 There, you can find calculators on home affordability, debt repayment and amortization. There is also a really handy tool called the Credit Score Simulator. This clever tool allows you to see what certain actions might do to your credit score. For example, opening up a new credit card OR closing a credit account. 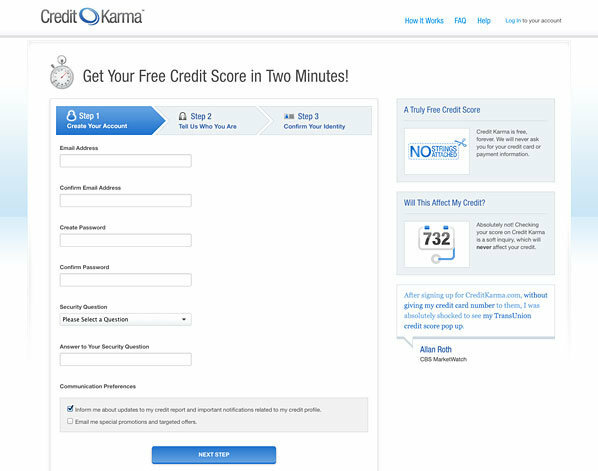 Given the free handouts, you may be wondering how Credit Karma makes money? After getting your credit score, it won’t take you long to see how they are able to subsidize their site: through ad partners. Based on the information you’ve provided and your credit score, Credit Karma offers recommendations on different credit cards, auto and home loans, refinancing offers, banking and more. Along with these offers, Credit Karma offers a “Reviews” section where users have given their two-cents about different products and services that you can read through before you decide to accept one of the offers. I really like this feature and it further illustrates they are trying to serve their customers well and do the right things. While the opinions expressed are our own – this post has been brought to you by Credit Karma. 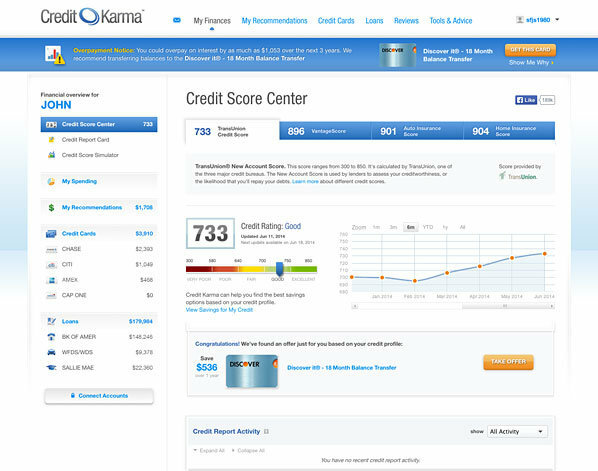 Images courtesy of Credit Karma, Inc. This is the most helpful site and as well as being honest, reliable. Glad to hear more about Credit Karma, Aaron. Sounds like a valuable company for consumers! If you don’t start taking control of your finances, your finances could get out of control and take control of you. So it is best to learn financial literacy at all ages. I’ve used Credit Karma for quite a long time to check my score….but it is important to know that they do NOT provide your FICO score that is used by many lenders. It is, however, very useful in simply checking your credit score trend as there is a correlation between all the different credit score calculations. Excellent point Travis – thanks for bringing that up. The scores are useful guides. This is a good point. I’ve used Credit Karma for years now too and it’s a great way to determine where you may fall. A definite must have app though.